The state’s minimum wage goes up to $11 an hour on Dec. 31. Managers and other exempt workers will see an increase to $825 a week. New state laws will soon usher in significant changes for workers on Long Island. The statutes will increase their take-home pay, and, for the first time, give nearly all private-sector employees paid time off to care for a newborn or seriously ill relatives. On Dec. 31, the state minimum wage on Long Island will rise to $11 an hour from the current $10 under a wage change that varies regionally and spans several years. 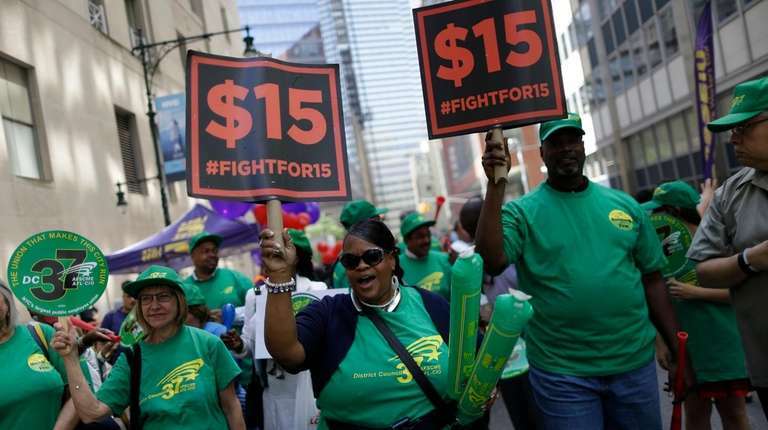 The minimum for fast-food workers will rise to $11.75 an hour from $10.75. On the same day, some Long Island employees who are exempt from overtime, such as managers, will also see their pay rise. Their minimum salary will rise to $825 a week, from $750. Those workers, as well as those classified as administrative employees, like some administrative assistants, don’t have to be paid overtime when they work more than 40 hours a week, but must be guaranteed a minimum salary. The federal minimum salary, which the state’s supersedes, remains at $455 a week. As of Jan. 1 the state’s new Paid Family Leave law will grant eligible employees time off to care for a newborn or chronically ill spouse, children, parents, domestic partner, parents-in-law, grandparents or grandchildren. Under 1993’s federal Family and Medical Leave Act, which covers unpaid leave, the definition of family is limited to newborns, children, spouses and parents. The state law will cover employers with as few as one employee. The FMLA covers companies with a least 50 employees. Unlike the FMLA, the state law doesn’t grant workers time off to care for their own serious health problems. State disability and workers’ compensation programs cover that. The first year of the state’s paid leave law will give eligible workers up to eight weeks off at 50 percent of their average weekly wage, with the maximum weekly time off increasing to 12 weeks at 67 percent of pay when the law is fully implemented in 2021. Wage amounts are subject to the state average weekly wage cap. Employees, he said, should make sure their documentation is in order when they file for a leave.